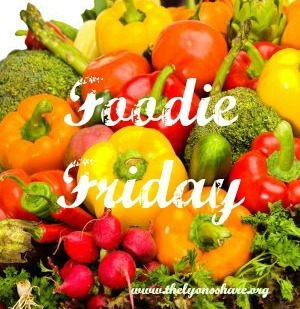 Happy Foodie Friday, and Happy 100th Post to The Lyons’ Share! It seems like just yesterday that I started the blog, but it also feels like it’s been an important part of my life forever! I truly appreciate all of you who read, comment, share, email, and send smoke signals my way :). Here’s to many-more-than-100 future posts! In today’s post, I’m going to review a new-to-me product, give you a major discount code, and share a new recipe with you! Several weeks ago, I was contacted by All Pro Science to see if I’d like to review their 100% Grass-Fed Whey protein powder. You know I love trying new health products, so after investigating the company a bit, I accepted the generous offer! 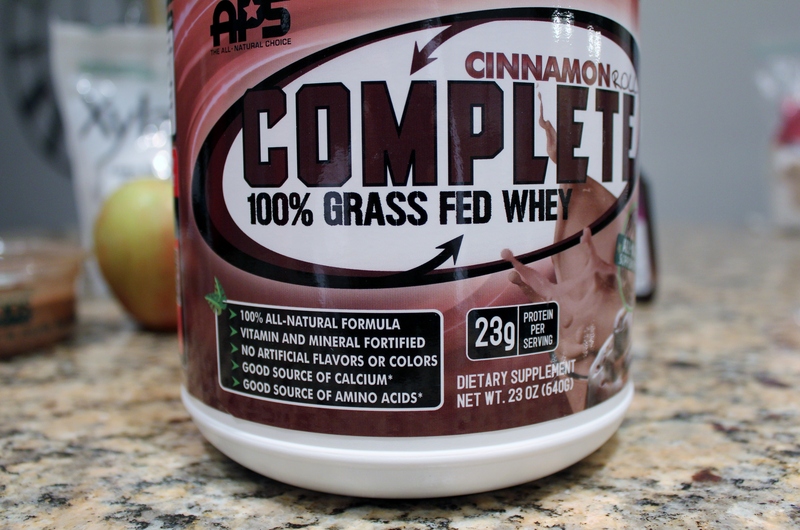 I was able to choose my flavor (APS offers the 100% Grass-Fed Whey Powder in French Vanilla, Bavarian Chocolate, Strawberry Creme, Banana Creme, Mocha Latte, and … Cinnamon Roll!). I love my cinnamon, so it was an easy choice. (Note that I would not have accepted the gift of protein powder if I didn’t genuinely want to try the product, and I was not compensated in any way for this review. All opinion are ALWAYS my own!) As soon as I received my bottle, I was excited to learn even more about the benefits. Like I discussed in my post on the 7 benefits of protein, I place high importance on getting protein into my diet. I would prefer to get my nutrition from whole foods “in a perfect world” … however, I often rely on convenience foods that have as few ingredients as possible, and are made with as high-quality ingredients as possible. 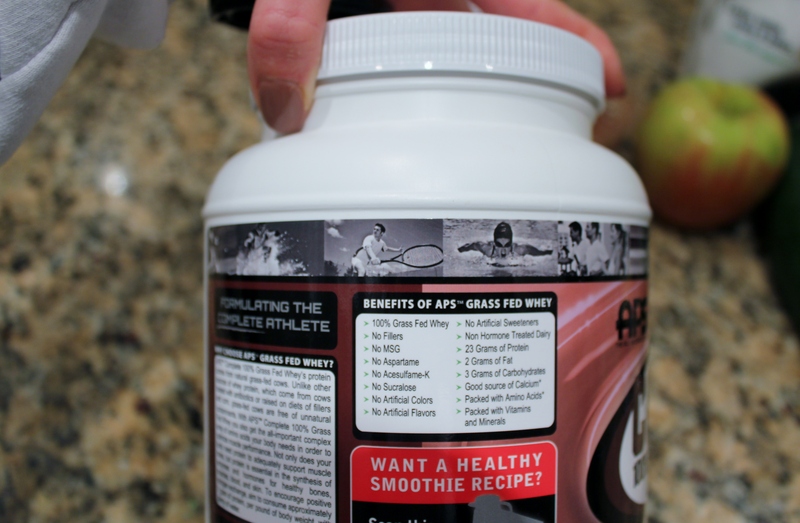 I liked that the APS powder had ingredients I recognized, contained no artificial sweeteners (it’s sweetened with stevia), was produced from cows who receive no hormones (which makes the product a lot healthier and “cleaner” for you), and had great nutritional stats (2g fat, 3g carbs, 3g sugar, and 23g protein for each 130-calorie serving). Whey protein powder is highly absorbable, and is high in Branch-Chain Amino Acids (which help with muscle repair and recovery). However, if you’re vegetarian, lactose-intolerant, or prefer other sources of protein, All Pro Science also offers a 100% plant-based, gluten-free, soy-free protein powder (which I have not tried)! So, how was it? 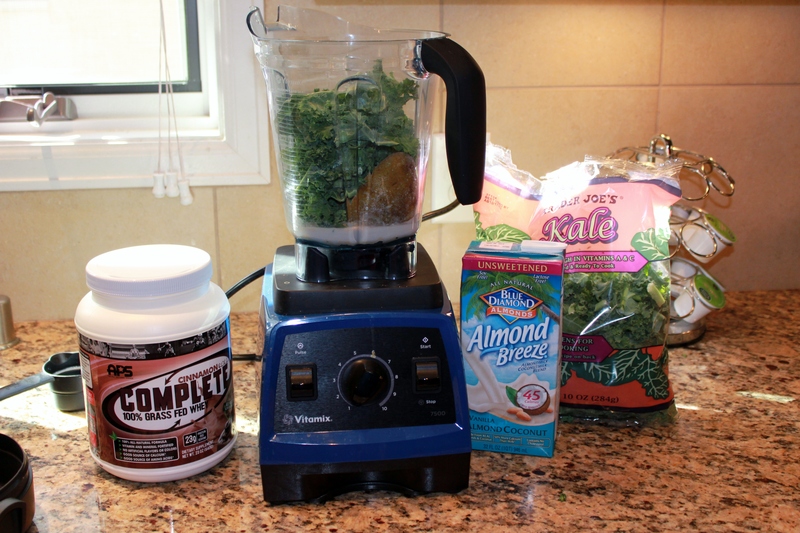 I loved the protein powder in 3 of the 4 ways I’ve tried it (including in the muffins I’m about to share with you)! I have to admit that my previous go-to protein powder (Vega) leaves a less-than-pleasant aftertaste when used in baked goods, and the All Pro Science powder had none of that aftertaste. The texture worked well, and while the cinnamon roll flavor wasn’t incredibly strong, it did give a nice hint of cinnamon! It settled great with my sensitive stomach, and I’ll definitely use it again for baking. The only way I didn’t love the powder was in green smoothies. So far, I’ve made 2 green smoothies using the APS powder (the one below was pear, almond milk, Cinnamon Roll APS, and kale), and it just didn’t live up to my beloved Vega Vanilla Chai. I’m going to keep trying, though! 40% off Promo Code for All Pro Science! 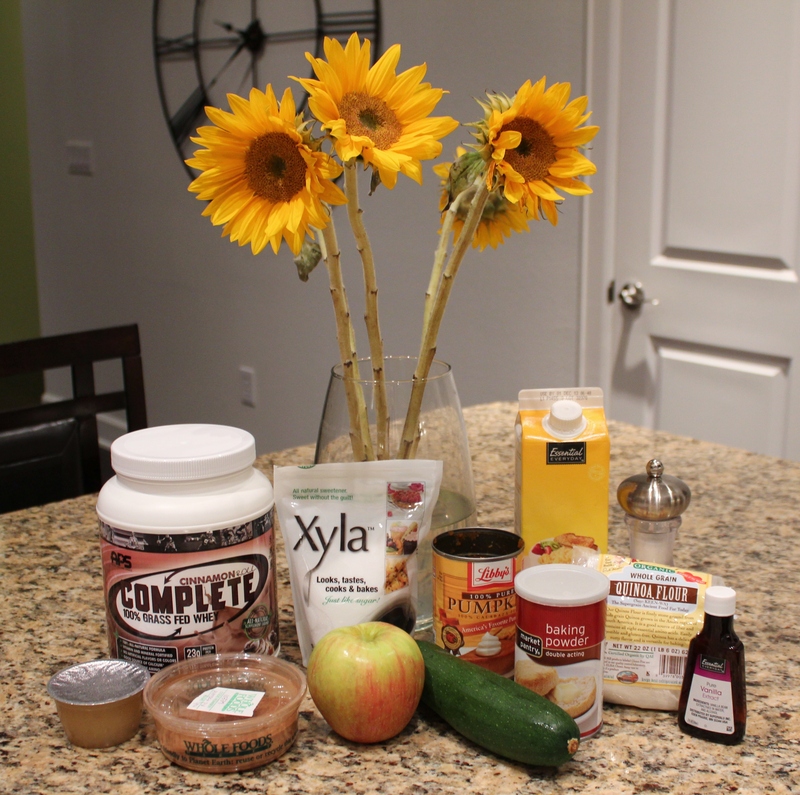 Do you want to try All Pro Science protein powder? Good news! I have a 40% discount code for you to try it out! From the All Pro Science website, you can use the code LYON40 to receive 40% off your purchase. The powder comes in large (640g) bottles, and it’s rather expensive since you’re paying for high quality ingredients ($69.99) … this means that my promo code is worth $28! If you don’t want to order online, All Pro Science is also available at Whole Foods, Albertson’s, Amazon, Lifetime Fitness, and several other health food stores and gyms (the promo code won’t work there). Let me know if you try it! I know you came for the food, so I’m also going to share the first of a few recipes I’ve created using my Cinnamon Roll powder. Like my Orange Almond Protein Muffins, these are perfect for breakfast – filling, nutrient-dense, and sweet enough to be delicious (but not too sweet for breakfast!). I’ve been enjoying the muffins as snacks with almond butter slathered over them, or crumbled on top of my favorite breakfast in place of the oats. Grate your zucchini into a large bowl. Blot or pat dry, but don’t squeeze out the extra liquid. Add in egg whites, pumpkin, applesauce, and vanilla, and stir gently to combine. 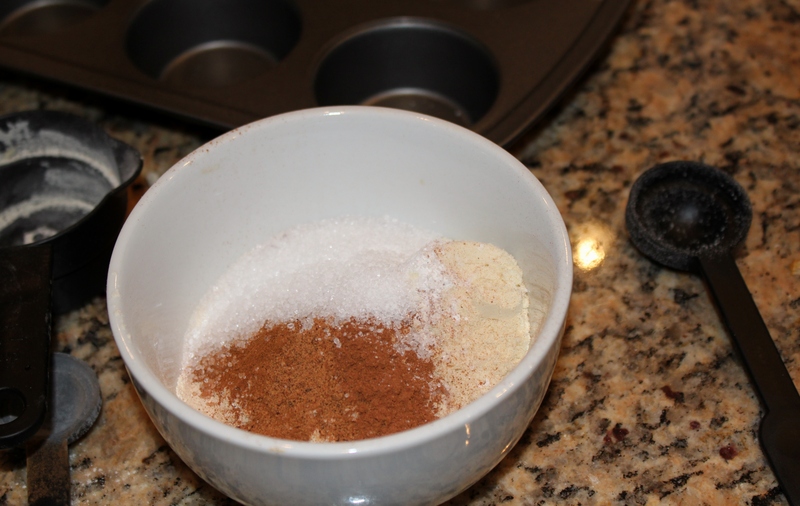 In a separate bowl, mix your dry ingredients (protein powder, flour, spice, salt, baking powder, and sweetener). Pour dry ingredients into wet ingredients, and stir to form a batter. Chop apples into small pieces, and sprinkle a little bit of extra flour on top, until apples are just coated (this helps the apples stay distributed throughout the muffins, rather than sinking to the bottom!). 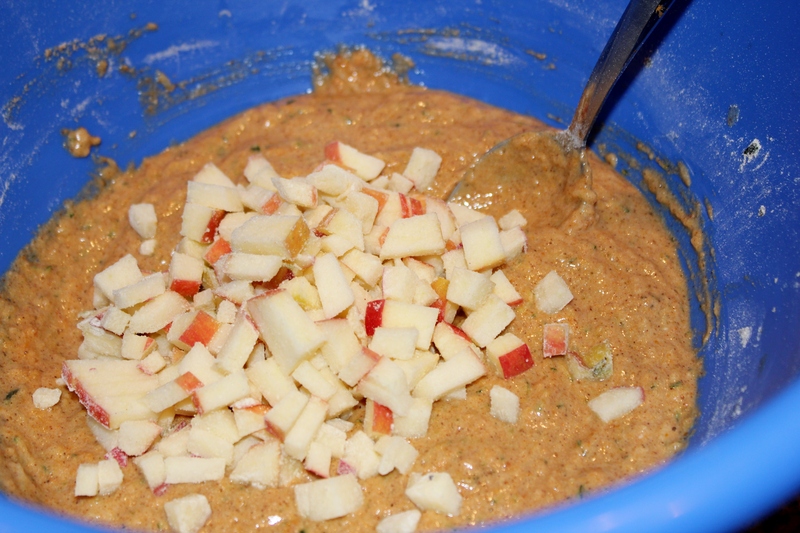 Fold apples into batter and gently stir to combine. Distribute batter among 9 muffin cups, sprayed with oil or cooking spray. Bake for 20 minutes at 350 degrees, and enjoy! 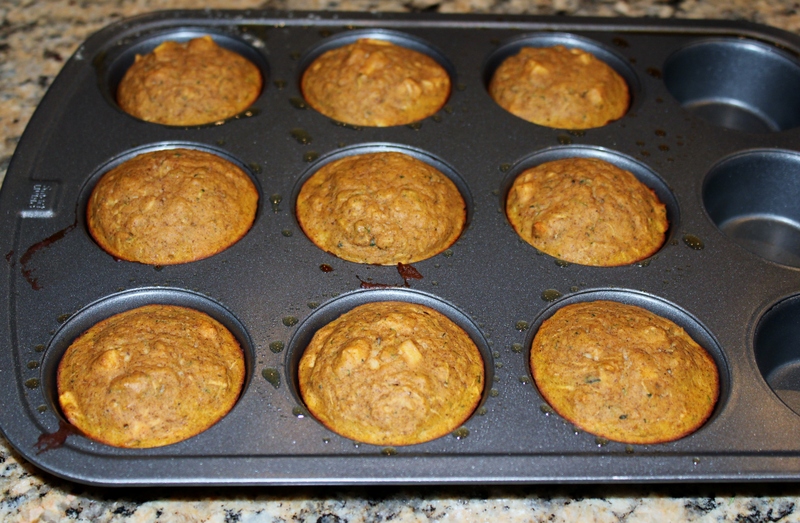 If made according to these instructions, each muffin will have 72 calories, 1g fat, 12g carbs, 5g protein. So tell me in the comments … Do you like hidden vegetables in your baked goods? Any creative ideas to share? What has been your favorite post out of my 100 posts? Oooh! 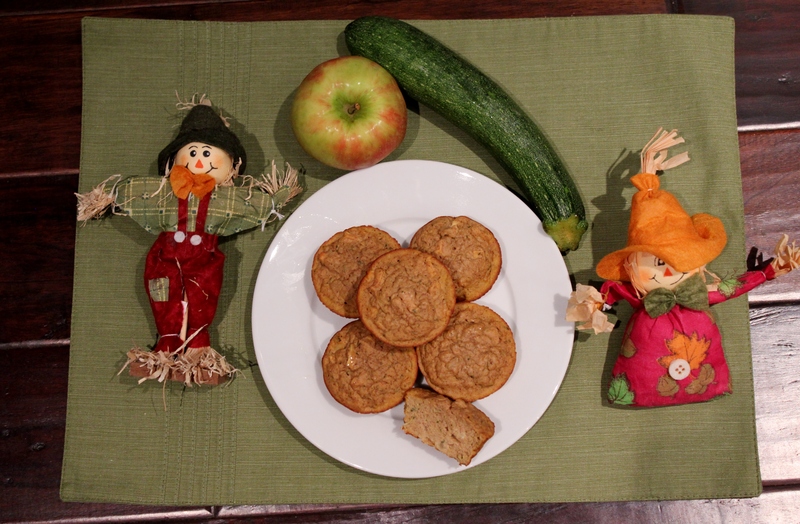 Those Zucchini Apple Muffins sound DELICIOUS! I am going to have to make these sometime after our traveling ends 🙂 Thanks for sharing Megan! I hope you do make them, Sara! Hang in there with all the traveling – I know it’s all fun stuff, but I’m sure it’s tiring, too! 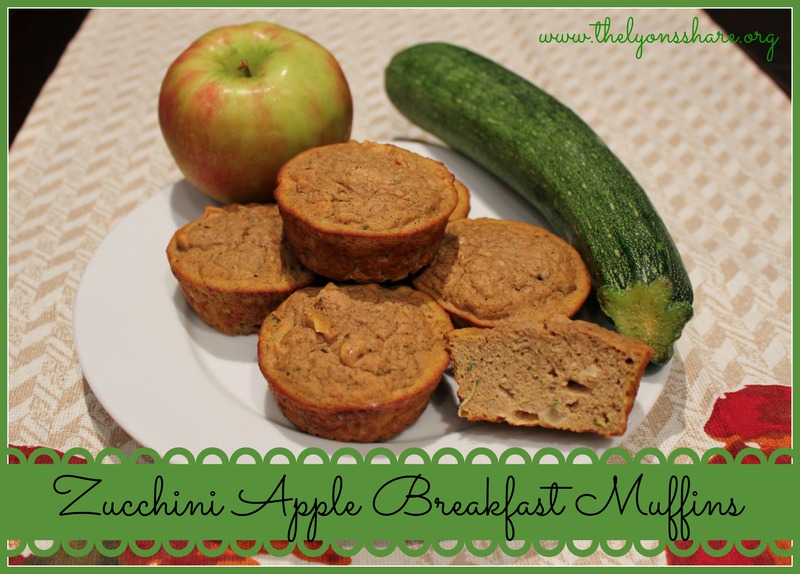 I am a fan of ANY kind of zucchini bread or muffins, so I’ll definitely have to try this recipe! Happy 100th post! Keep it up girl!! Thanks for the protein powder review. Stop by http://www.recipesforourdailybread.com and link up your favorite posts, Pinterest, Twitter, & Facebook pages. 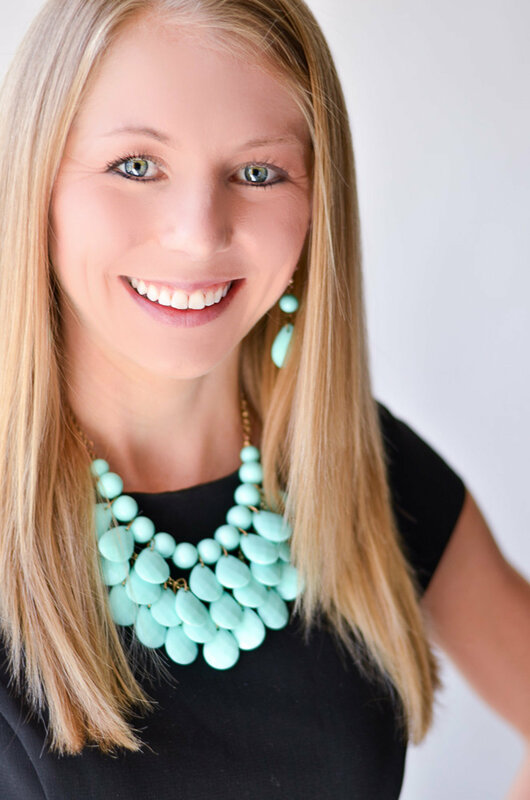 Thank you for hosting the link up, Diane! These muffins look so good! My nephew refuses to eat veggies so I try to hide them in baked goods. The zucchini muffins didn’t fly though because he could see the green. Pumpkin has been easy to hide though! That’s so funny – my nephew is the same way! He’s 13 now … how old is yours? It must be a boy thing, because my 3 nieces that can eat solid foods (the 4th is a baby) will all TRY vegetables – they’re picky in what they like, but at least they will give it a shot. Not so much with the nephew, though! Congrats on the 100th post! Great milestone! 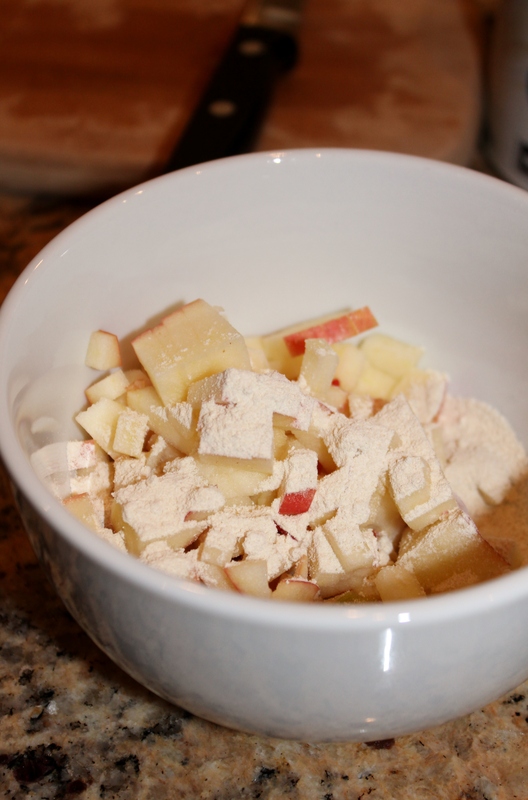 Love the recipe … just a drag that my wife is allergic to apples. So all of those cool recipes – and substitutions including applesauce – are ruled out. Oh well .. Thanks, Michael! I wonder if you could substitute in pears (similar consistency, and goes well with cinnamon! ), and double up the pumpkin instead of applesauce? Michael Anderson recently posted…OH NO! Are We Facing a Global Wine Shortage?!? Hi Rachel!!!! So happy you’re stopping by!!! You completely made my day. Hope all is well with you, and let me know if you have anything you’d like to see on the blog! Happy 100th post!! Lets see another 100, and another 100. I’d never heard of that brand before but I’m intrigued- I often order alot of my protein powders from the States because the ones we have here…..not palatable at all! That recipe looks great and also stats to boot! I love adding hidden veg to baked goods, pancakes, oatmeal etc- I wish that they would sell zucchini pre shredded! I had never heard of the brand before either – not sure how I’ve always overlooked it in Whole Foods, etc. 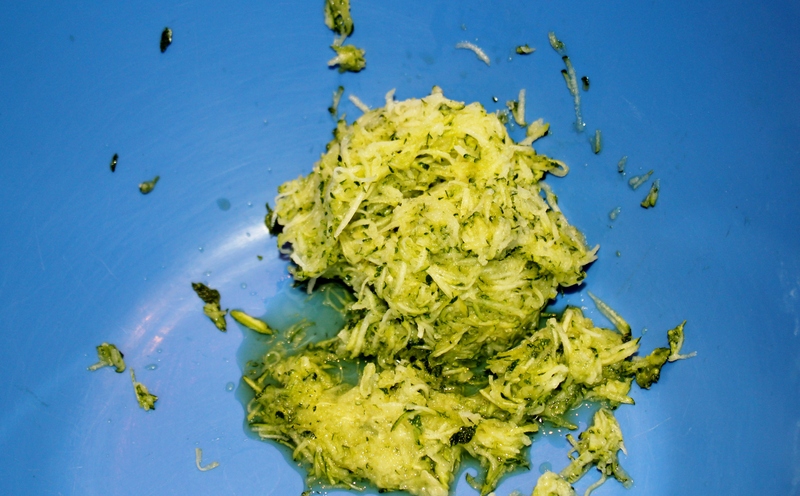 Zucchini pre-shredded is a GREAT business idea … why doesn’t that already exist?!? I wonder if too much liquid would seep out after it sits for a while. I use grated zucchini in a ton of recipes, but it sure is a pain to grate! Thanks, Jill! Vega has always been my go-to, also (and still is for smoothies! ), but I did find it had a bit of an aftertaste in baked goods. And, there is protein powder in the recipe! Maybe you missed it since it’s hidden in the middle of the ingredient list. Thanks for stopping by! Thank you for providing a review of the All Pro Science and accompanying a recipe with it. I really like how creatively the recipe incorporates zucchini. Definitely going to try it out for my picky 3-year old. I hope you enjoy it, Angela! Just made these and they are so yummy. I used arrowroot flour and it was super yummy. Thank you again!! So glad you enjoyed them, Jessica! Thanks for making them! Hey Megan! I know this is an old post but my friend and I want to make these and I have some leftover coconut flour. Would you sub the same amount or use a little less? Looking forward to the next reset!! I would definitely do a little less, Katie! See this post, and consider that quinoa flour (which I used) is more like almond flour, or maybe somewhere in between … http://www.dummies.com/food-drink/special-diets/paleo-diet/substituting-coconut-flour-for-almond-flour/. You want the consistency to be like cake batter (not brownie batter) before you bake them. Good luck and enjoy!